and a million species of living beings will become extinct. The end of winter might mean the end of life. Twenty degrees below zero. The bird feeder is empty, the heel of bread eaten, the weekend visitors have closed the door behind them. Orion is up, not a tree moves, nothing expends energy, only what is needed to hold everything in place. I keep my wits, kindle a big fire in the Freeflow barrel stove, place a worn sheepskin on my chair and curl up. The barely insulated walls of my one-room cabin and the fire are my warmth. The thaw begins the next day. After a stretch of sub-zero mornings, one ice storm and many snowfalls, the world unlocks. I split wood in the warm sunshine in army issue wool pants, an Icelandic sweater, and knitted cap. Walking into town with the dogs to get the mail, I inspect moose tracks in the center of the dirt road. They lead to a pile of first cut hay, full of vetch, red clover, and timothy – my neighbor’s offering to the resident moose, who like all of us, has been working overtime to stay warm this past month. When I return home, it is too sunny to go inside, so I make myself an outdoor room. I kneel beneath the maple tree where the bird feeder attracts chickadees, nuthatches, blue jays, and red squirrels. There, in deep snow, I sculpt a bench and a round table. The snow holds beautifully: wet, dense, and deep. On the table, I place a clay pot full of hemlock boughs. I collect two pack baskets worth of sticks and a scroll of white birch bark. I dig out my fire pit and kindle a fire with twigs and bark. I marinate chicken, clean the cabin, and invite a friend to supper. As daylight falls away, I look west toward the red glow where ridgeline meets sky. Inside, I run spring water over watercress, parsley, and purple cabbage, then toss them with oil in a red Mexican bowl. Behind me the sky deepens with darkness. The fire has burned down, and it is still warm inside. As I move a lighted match toward the mantle on the gas lamp, I hear footsteps on the cabin porch. This excerpt from my journal, kept while I lived in a one-room cabin in the hills of Vermont in the winter of 1992, documents a classic January thaw, several consecutive days of above-freezing temperatures in the midst of winter. 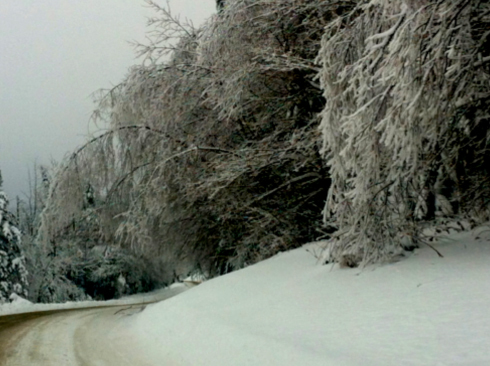 In Vermont, winter typically begins in November and ends in April. In recent years, the dramatic fall and rise in temperatures has mellowed as the climate has warmed. I feel winter’s identity shifting, and my own changing along with it. Last winter, in mid-February, my 15-year-old nephew Kyle and I attended an art exhibit at Vermont’s Shelburne Museum, entitled “32 Degrees: The Art of Winter.” The curator brought this mixed media collection together to explore the identities of snow and ice and to pique viewers’ nostalgia for the season. Included in the exhibit were large snow globes with darkly comic tableaux, a snow music video game, Monet’s “Haystacks, Snow Effect,” and three large digital images of tiny fishing shanties set in the center of landscapes of white by photographer Scott Peterman. The loss of winter due to global warming across the planet was the unifying message coming through the work of each artist. Inside the snow globes, children and adults in street clothes soared off the edges of icebergs with smiles on their faces, a woodcutter wielding an axe chopped a tree with black birds seated on every limb, and wolves surrounded a man perched on stilts. Outside on the museum grounds, we explored a village of fanciful fishing shanties, the work of several craftsmen paying homage to an age-old winter activity. On the field of greening grass, these tiny houses looked marooned and odd as space ships. It was 55 degrees Fahrenheit, a day of high clouds and intermittent sun. January’s snowfall had melted away. Kyle wore a light jacket and blue canvas boat shoes. We took pictures of each other with our phones as we opened each shanty door, sat on curving cedar benches, ran our hands along decorative carvings, and admired stained glass windows. From inside one house, Kyle looked out at me through a perfect cutout of a large geometric fish. Above the fish, carved circles of all sizes represented air bubbles. Closing the door of the house across from him, I sat down inside and looked out onto the empty field. A memory of my mother arose: She stood at the stove in our galley kitchen, battering and frying to a golden crisp the tiny smelt my grandfather had caught that day on a frozen Lake Champlain. Her back was to us as she dipped the fish by their tails into flour and egg batter, and then dropped them into hot oil in the skillet. I could almost taste the crispy fried batter, could almost see the little golden headless fish draining on brown paper lunch bags next to the stove. The Shelburne museum sits astride Lake Champlain, the sixth largest lake in the United States. Last winter, once again, it did not freeze over. Even the bays, usually solid enough to skate and fish on, were thought to be too precarious for fishing shanties. From 1860 to 1930, there was only one year that the lake, 120 miles long and 12 miles across at its widest point, did not completely freeze over. After that, each decade included multiple years when the lake did not freeze completely. The 1990s were a turning point. For seven winters the lake remained open, and in the first decade of the new century, only half of the winters saw a solid stretch of ice between Vermont and its far shore in upstate New York. Inside one of the artists' fishing shanties crafted of memory and imaginings, I sat on a bench and looked down at the hole in the floor where the ice would be cut. 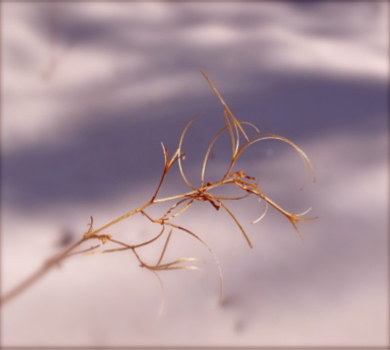 My gaze turned out the window to February’s grass, and I understood what it might mean to lose the full experience of a season in my lifetime. When I was Kyle's age, I could never have imagined such a thing. It is now nearing the end of January 2017, and Lake Champlain is open for the fifth winter since 2010. So far, only three days have registered below the average temperature for the month. Most have ranged much higher, as much as 27 degrees above the historical average; January 12 came in at 54 degrees Fahrenheit. Today, far from the lake, in the hills of eastern Vermont where I live, fat flakes of snow blow chaotically, then turn to ice that pings onto windows, and then transforms to rain that coats white spruce trees in a frosting of ice. A symphony of silence, a chorus of ice, a tympany of water. I chose the town where I live because it is well known as the center of a snow belt. I feel most fully alive in winter gliding on my skis through the forest. I am nostalgic for all that winter means and has meant to me. It is February and I breathe heavily, climbing on wooden skis through Nebraska Notch toward the junction with the Long Trail below Mount Mansfield. I am twenty-two. Gregg is ahead of me on the trail, his coat an occasional patch of blue through the thick flakes that fall, wetting our faces, sticking like icing to our wool hats. A few inches of new snow allows me to easily angle my skis as we herringbone the steep sections. Our wax holds, the skis grip, and I use my arms to anchor metal poles and push downward. At the trail junction, a wind gust obliterates our visibility; Gregg looks back to me. I nod that I want to continue. Our destination is Taylor Lodge, a favorite spot, and I mean to get there one more time before I leave. Through blinding snow we press slowly on, focused on finding the white blazes on trees that mark the trail. We travel like this for at least a mile, and just as I realize I am scared, the snow lets up and begins to fall gently. Beneath our skis, the powder is deep. Above us, clouds rise in between firs and balsams. I feel my effort lessen as we start to glide down toward Taylor, kicking with long strides through fresh snow. It's so easy now. I love this, more than anything. Soon, the roof of the lodge comes into view. We tamp down a smooth place with our skis, remove them, and hop up onto the porch. Snow buries the stairs. Little paths have been worn through snow to the half-door and along the porch. We kick new fluff from in front of the door and open it. Inside we shed our parkas and put on the down vests we pull from our packs. After slipping on spare hats and gloves, we retrieve our lunch: a thermos of tomato soup, cheese, and bread. We place the meal on the wooden table and sit next to each other on the bench. We pour soup into stainless steel cups and drink. Salty, thick and warm, it relaxes my stiff limbs and I lose the slight chill I had. I cut cheddar into wide slices with the Swiss army knife Gregg gave me and place them onto wedges of bread. A whirl of wind sprays snow onto the table. Thin shafts of sunlight appear. We walk to the door and watch the clouds lift a little, not enough to open the view of the Champlain Valley spreading below the rock face in front of the lodge. Now, three decades later, each passing winter tells me that the winters I knew as a youth are becoming extinct. I feel this loss as grief, as for someone I love, with whom I feel intimate. Skiing in deep snow below Mount Mansfield in winter is part of my story, my geographical autobiography. On a sub-zero day or in the midst of a white out, the warmth of a sturdy shelter, a cup of hot soup, a cozy place at the wooden table engenders an intimacy with others and ourselves that may be more difficult to access when the weather is warm and the energy is high, as in the height of summer. Experiences in the cold, snow and ice tell me who I am, over and over again. Remembering them makes me feel good. In 2012, The Atlantic reported on a study first published in the American Psychological Association’s journal Emotion and conducted at the University of Southhampton. 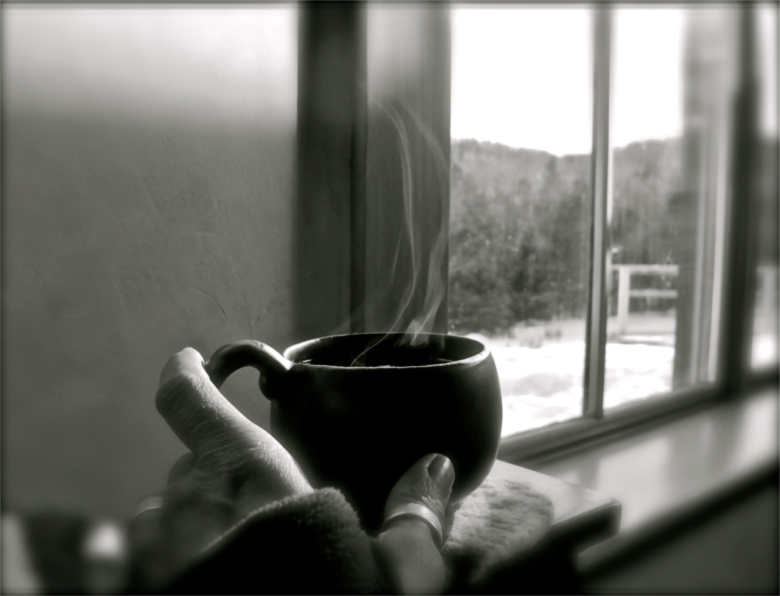 The study linked an increase in nostalgic feelings to cold temperatures. The college students participating in the study claimed more nostalgic thoughts in cold rooms and on cold days, and, interestingly enough, experiencing nostalgic thoughts correlated to an increase in the participants’ body temperatures. Feeling nostalgia literally warms us up. I wonder if nostalgia may be an antidote to experiences that leave us emotionally cold, sad, or depressed – such as our changing climate. I think again of the Shelburne Museum exhibit. The painted winter landscapes, the fishing houses, snow covered haystacks, and snow globes reminded me of the winters of my childhood and young adulthood. What happens to us when there are fewer of those memories to stir? That day at the museum, after Kyle emerged from a dome-shaped shanty, we went back into the museum. From the far edge of the gallery, we heard the low moan of a glacier calving. Kyle walked to the source of the sound, a screen stretched across one full gallery wall. With his phone, he took a video of the video. It was several minutes before a section of the Iceland glacier cracked, slid, and plunged into the ocean. Kyle seemed small before the sound and the slow, certain crash of ice, much as I was once small before the snow squalls filling Nebraska Notch. Will Kyle’s geographical autobiography include the story of winter as told on a gallery wall? For what will he feel nostalgia? Several years after my last ski with Gregg in Nebraska Notch, I found my way to a job in the White Mountains of New Hampshire, and thereby, back to winter. On the day of the Winter Solstice, a neighbor told me he believed that because their lives were so entwined with the seasons, ancient people knew they had to participate in ensuring that the sun would return. Each year on the afternoon of the Winter Solstice, in the long shadow of his ancestors, my neighbor skied to his special place on a mountain trail above his home to make sure that the light would come back. The following year, in encroaching dusk on the Winter Solstice, I skied alone up a trail along the Smarts Brook in the White Mountain National Forest. 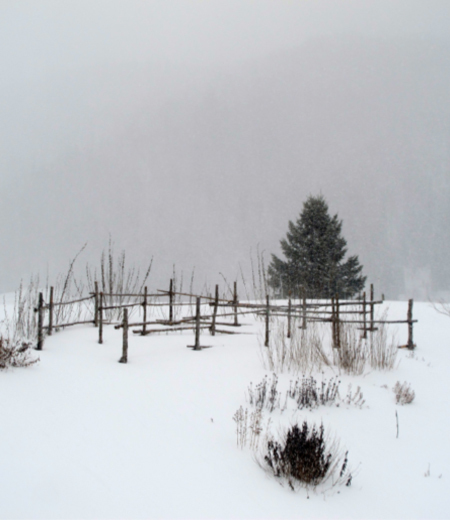 The whispers of my wooden boards in the snow plied the silent air, rich with the scent of balsam fir. I skied up to a west-facing outlook, and then stepped off the trail to watch daylight fade on the darkest day of the year. I felt my skis sink. The late afternoon sky was pale, the falling sun gone, and the evergreens were nearly black against the whiteness. I stood for some minutes, waited until true dusk, and then quietly slipped back down the trail, navigating by the light of the snow. 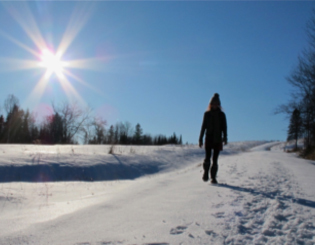 My neighbor’s story had become my own myth, a tradition that I keep– whether on skis, snowshoes, or on foot– of taking myself to a special place outdoors on the year’s shortest day so that winter will come and the light will return. In my memory of that first Winter Solstice ski, I see myself as if in a painting, standing still in the forest on my old blue wooden skis, not aware enough yet to feel nostalgic for the deep snow, for the young woman I was, and for my neighbor, no longer alive. But here and now, on the far side of that memory, I am deeply nostalgic for Nebraska Notch in winter, for the sub-zero nights in my Vermont cabin, and for the sight of 12 miles of frozen lake between two long shorelines. The memories warm me today, at the end of a mild January, as the temperature drops below freezing and snow begins to fall. Anne Bergeron, M.A., I.M.A., is a free-lance writer and teacher who lives in Corinth, Vermont and is currently working on a collection of essays that explores rural living through the lens of our changing climate. She lives on a homestead that she built with her husband where she tends gardens, sheep, and chickens. Anne also teaches yoga to people of all ages, and is a 2011 recipient of a Rowland Foundation fellowship for her transformative work in public education.